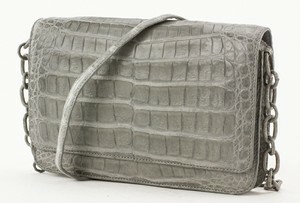 APSREY Tan Lizard Skin Small Cross Body Bag. Silver hardware. Adjustable shoulder strap. Wallet style interior with coin pouch and card slots. Clasp closure. Light wear on hardware (see photos).